We get in Bamburgh on a double-decker bus - which, as far as I am concerned, is one of the peculiarities about travelling in the UK which mostly enthralls me. Ginger Cat & me have an almost childish taste about travelling on double-deckers - obviously upstairs, where it feels like flying. And in fact in the seat next to ours there are Batman & Superman - or, better, two young boys wearing the caps of their fave superheroes. And we fly with them. After all, as it's known, also Batman doesn't fly, if not with the aid of some technological Bat-gadget. Or with a double-decker bus, come to that. Anyway the landscape we are crossing is amazing: fields are enlighted by the golden kiss of the sun, and everything is so beautiful that we are able to enjoy it, ignoring for once that tiny voice that keeps on complaining about how you cannot take pictures of this beauty, because of the army of kamikaze mosquitos committing their last sacrifice on the bus's windshield. After having visited Alnwick Castle (a.k.a. Hogwarts), seat of Ralph Percy, 12th Duke of Northumberland, and praised from its witty tourism marketing strategies as "the most beautiful castle you've ever seen", we weren't expecting to see a more majestic and bigger castle in the same county. Bamburgh Castle doesn't go unnoticed, and, as soon as we hop off the bus, it's the first thing we get to see of the landscape in front of us, and it makes us aware of who's the boss here. A long and narrow road of stone cottages covered with roses bows at its feet, and there it is, proud and big on a squat rock pedestal, to rule with royal leadership the coast and the tiny village. The uphill is a bit steep, with peeks of rocks and cobbles, and it looks like a path in the mountains. It suits well the metaphor of the quite grumpy pride of Northumberland, which, just like a hedgehog, opens up giving its most beautiful part only to those who take the effort to climb it, to those who take the risk to try to win it over. 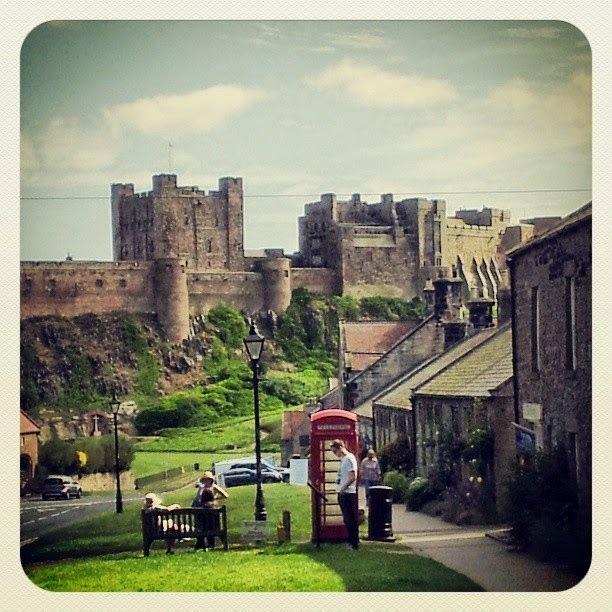 Now we start getting why the cunning Ralph has chosen Alnwick and not Bamburgh for his residence. And then the same forementioned sign, tells us that Bamburgh already has some other inhabitants. Inhabitants that it's not easy to take out, either in a polite or in a rude way. After all, we are nearly in Scotland here, so every respectable castle must have its own ghost. Here they have three of them. There's a little 6 years old girl named Sophie who had got lost in the castle, and who, when she gets to bump into somebody, seeks for their hand to get guided: she's a sweet girl, but also a bit temperamental, so, if you happen to meet her, you must greet her and pay attention on her requests, or she'll be the one to guide you and make you lost, just like it's happened to her during her short life in this world. There's the desperate cry of a baby, whose mum has fallen from the Clock Tower when she was holding him: was she suffering from vertigo? Or has she slided? ... or perhaps she's been pushed? The crying creature is still too young to be able to explain it, and anyway his wailing has been the last sound he's been able to emit. About the Pink Lady instead we know for sure she's thrown herself down: her name was Catherine, she was twenty and she was extremely beautiful. She was also very much in love. But her father didn't like her boyfriend, not even a little bit, maybe because he didn't have any noble blood running in his veins; and so he decided to send him away across the sea. But neither this worked out to make her heart forget him, so she spent years waiting for him, refusing any other pretenders. Her father, then, esasperated, lied to her, brutally telling her that instead he had forgotten her, that he would have never come back, because he had got married in France, and he would have stayed there. The last thing he saw of his daughter had been the fluttering of her dress while she was throwing herself from the highest tower of the castle. And the only thing he had got left of her has been her perfume of roses, that still can be smelled nowadays when she decides to appear in the castle. She's always stayed here, the Pink Lady. Maybe she's understood that her father has lied to her, and she's still hoping that her beloved one will come back. The internal of the castle is quite plain, and I must admit that, inside, Alnwick was surely more interesting. Nobody has taken my hand, nor I've smelled roses. I've heard a baby crying, but he was alive, pretty chubby and wearing a Peppa Pig tee, which I guess wasn't used during Middle Ages. The steep uphill has somehow been in vain, then? The Castle was hiding its real beauty, and now it's showing it. You just need to lift your eyes above the walls. 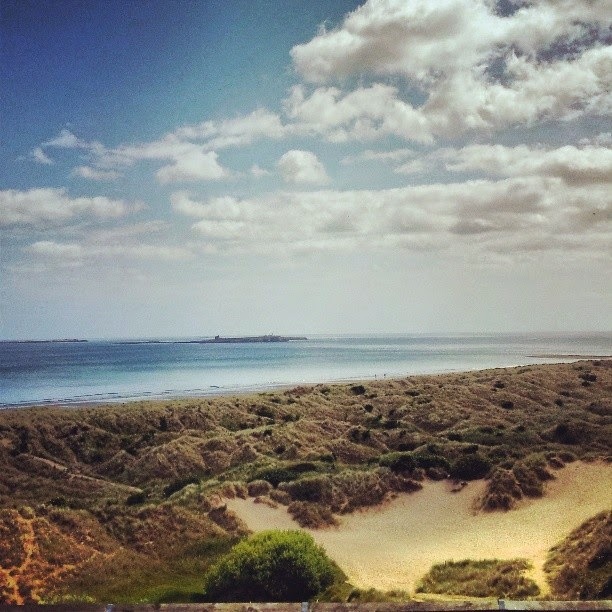 The sandy coast lashed by the breeze, the turquoise sea melting with the sky, and, on the horizon, the Farne Islands. An enchanting view, that, from here, you can enjoy from a privileged point of view. The Castle dominates the coast, dominates the sea, but the Farne Islands run far away. They do not get dominated by the Castle. They already have another kind of dominion. I do not know Warkworth but I'll surely check it out for the next time. I'd be pleased if you reblog me, go ahead!! I meant :-) of course!